The Star Wars Resistance panel was also held today at Star Wars Celebration Chicago. And while the livestream suddenly cut away from the panel, just as the the first episode of season 2 was about to be screened, we do have at least the poster to show you. Apparently Tam will be a First Order cadet named DT-533 in season 2, which is supposed to pick up right after season 1 ended, with the Colossus in space and Tam with the First Order. Not much else is known at the moment, but more news will certainly leak. Will you follow season 2 of Resistance which will air later in 2019? I think season 1 was more or less entertaining, but had too many filler episodes in which nothing of consequence happened. 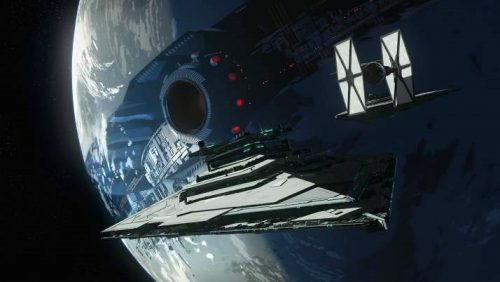 Maybe things will pick up speed in season 2, now that the First Order is invading the galaxy and with the Colossus in space. 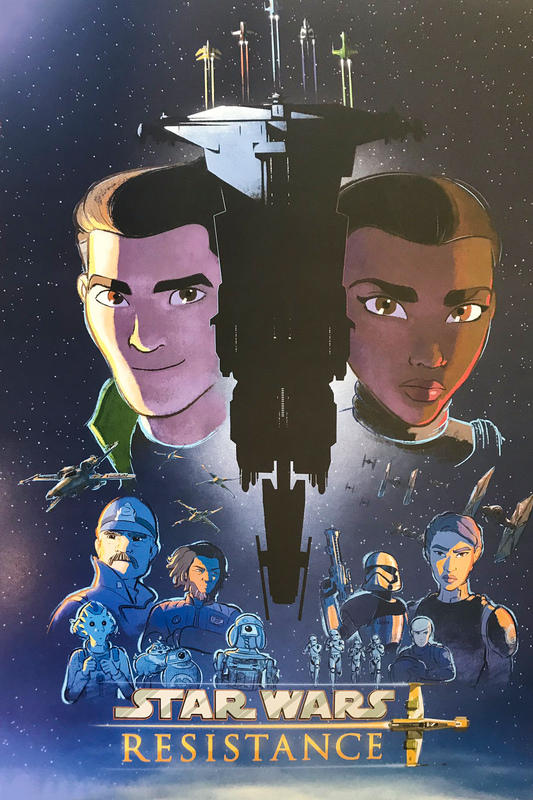 The season 1 finale of Star Wars Resistance aired last weekend, time to look back at the past 20 episodes and to discuss what you think about the show. 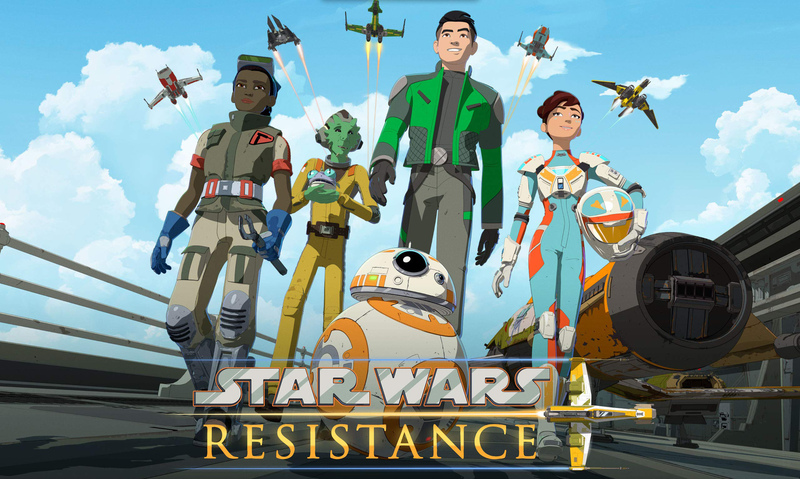 So click through for a very spoilery discussion of Star Wars Resistance. Anyone not up to date and anyone wanting to avoid spoilers should absolutely not read the article and comments. Yeager & Bucket Back In Stock On Amazon! You can order Jarek Yeager and Bucket on Amazon once again. Special thanks to JTA reader JAGUIDI1313 for the alert! Tonight we are adding the Jarek Yeager/Bucket (R3-B7) Two-Packs set to our Star Wars [Resistance] Visual Guide. Click below to check out our full guide page for this set, and click here to read our full review. Let’s finish up the Star Wars [Resistance] line with the Poe Dameron/BB-8 Two-Packs set. It’s another nice release. Check it out in our Research Droids Reviews today! Be sure to leave your thoughts in our comments section, vote in the poll or even comment about it on our Facebook page. Click the banner below for the direct link to the review! As always, you can also send your review requests via email if you’d like to see something that we didn’t cover yet. The Jarek Yeager/Bucket (R3-B7) Two-Packs set from the Star Wars [Resistance] line should be one of your first must-have 2019 action figure purchases. We’re not kidding. Hasbro also goofed on the droid’s name. See why you need this set in our Research Droids Reviews today! Be sure to leave your thoughts in our comments section, vote in the poll or even comment about it on our Facebook page. Click the banner below for the direct link to the review! As always, you can also send your review requests via email if you’d like to see something that we didn’t cover yet. Jarek Yeager & Bucket Pre-order On Amazon! In case you missed our post on this earlier on Facebook today, you can pre-order Jarek Yeager and Bucket on Amazon. Special thanks to JTA reader Scott M. for the alert! Star Wars Resistance is officially picked up for a second season. Along with the announcement, we get a look at the second half of season 1 with some interesting appearances. We get to see several characters witnessing a holo of the speech given by General Hux, which would lead us to believe that Star Wars Resistance will merge with the events of The Force Awakens. It will be interesting to see how they handle this given BB-8’s presence in both Star Wars Resistance and The Force Awakens. Click through for the full press release and trailer. ← Sneak Peek! TVC Klaatu (Skiff Guard) (VC135) It's Another Gem! It’s time to close out our Visual Guide updates from wave 1 of the new Star Wars [Resistance] line of figures with the First Order Stormtrooper. Click below to check out the complete Visual Guide, and then head on over to our full review for additional details and gallery images. It’s our final year of Research Droids Reviews! A new year means new figures! Let’s finish up the first wave of Star Wars: Resistance figures with the First Order Stormtrooper. Be sure to leave your thoughts in our comments section, vote in the poll or even comment about it on our Facebook page. Click the banner below for the direct link to the review! As always, you can also send your review requests via email if you’d like to see something that we didn’t cover yet. New Star Wars [Resistance] Two-Packs Found At TARGET! JTA reader Geoffrey B. found the latest Star Wars [Resistance] figures at his local TARGET store. Sadly, they wouldn’t sell them to him because they have a street date of January 15th. These are two-packs, a pilot with a droid and they look very cool. Below is Jarek Yeager & Bucket (R3-B7) and Poe Dameron & BB-8. Commander Pyre is our next Star Wars [Resistance] Visual Guide update. Click below to check out our full Visual Guide, and also check out our latest review for this figure right here. ← SAELT-MARAE (VC132): EARLY REVIEW! 70+ IMAGES! COMPARISON SHOTS! It’s our final year of Research Droids Reviews! A new year means new figures! Let’s continue with Commander Pyre which is a reasonably well-done action figure from the Star Wars [Resistance] line. Be sure to leave your thoughts in our comments section, vote in the poll or even comment about it on our Facebook page. Click the banner below for the direct link to the review! As always, you can also send your review requests via email if you’d like to see something that we didn’t cover yet. 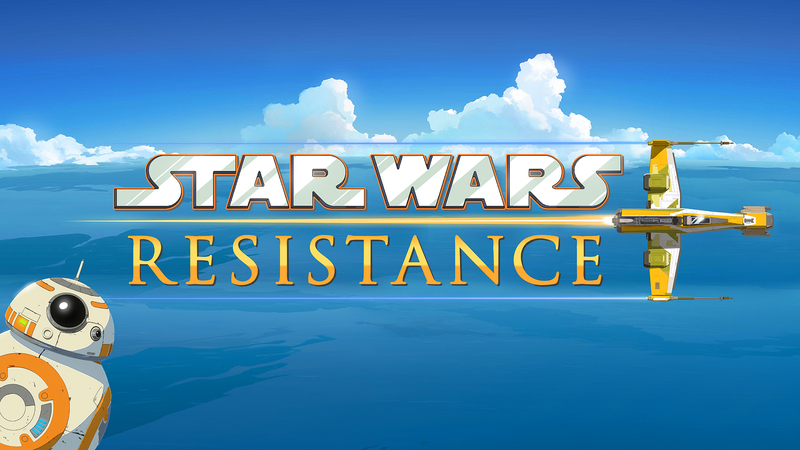 Up next for the Star Wars [Resistance] Visual Guide updates is Major Vonreg. Click below to check out our Visual Guide of this figure, and click here to check out our full review. It’s our final year of Research Droids Reviews! A new year means new figures! Let’s continue with Major Vonreg which is another beautiful action figure from the Star Wars [Resistance] line. Be sure to leave your thoughts in our comments section, vote in the poll or even comment about it on our Facebook page. Click the banner below for the direct link to the review! As always, you can also send your review requests via email if you’d like to see something that we didn’t cover yet. ← Previously SOLD OUT Disney Droid Factory Sandcrawler BACK IN STOCK! 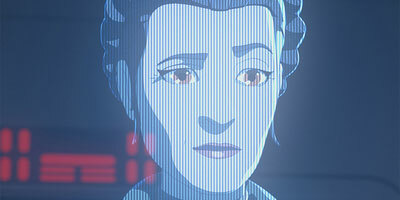 We continue our Star Wars [Resistance] Visual Guide updates tonight with a look at Synara San. Click below to have a look at our full guide page. Click here to check out our detailed review. ← Disney Acquisition Of Fox Finalized? It’s our final year of Research Droids Reviews! A new year means new figures! Let’s continue with Synara San, another lovely and new action figure from the Star Wars [Resistance] line. Be sure to leave your thoughts in our comments section, vote in the poll or even comment about it on our Facebook page. Click the banner below for the direct link to the review! As always, you can also send your review requests via email if you’d like to see something that we didn’t cover yet. ← Cheap Loose Super-Articulated FO Stormtroopers On eBay! Next up for the Star Wars [Resistance] Visual Guide updates is Torra Doza. Click below to check her out in our full Visual Guide, and make sure to also read all about this figure in our full review. It’s our final year of Research Droids Reviews! A new year means new figures! Let’s continue with Torra Doza, a brilliant new action figure from the Star Wars [Resistance] line. Be sure to leave your thoughts in our comments section, vote in the poll or even comment about it on our Facebook page. Click the banner below for the direct link to the review! As always, you can also send your review requests via email if you’d like to see something that we didn’t cover yet. The new Resistance figures are out, and we’ve opened up our Star Wars [Resistance] Visual Guide with our first update: Kaz Xiono. Click below for our full Visual Guide page, and make sure to stop by our review database to check out our full review. It’s our final year of Research Droids Reviews! A new year means new figures! Let’s begin 2019 with Kaz Xiono, a brilliant new action figure from the Star Wars [Resistance] line.Be sure to leave your thoughts in our comments section, vote in the poll or even comment about it on our Facebook page. Click the banner below for the direct link to the review! As always, you can also send your review requests via email if you’d like to see something that we didn’t cover yet. Don't Forget To Check The Clearance Aisles For New Resistance Figures! We’ve received plenty of email reports that the Resistance line is being found in the clearance section and at some stores ringing up at $5.00 per figure. Now we have evidence. So, if you’re looking for these figures, be sure to check the clearance aisle too! Special thanks to JTA reader MDS RR for the report! Walmart is the BEST! We have a sneak peek for you tonight of the first wave of Star Wars: Resistance figures. As I opened up, inspected, played with and photographed these figures, I couldn’t help but wonder if The Force Awakens and The Last Jedi were made of up of realistic versions of these animated characters if it the films wouldn’t be so heavily panned by the longtime facet of collectors and collectors would be more engaged with Hasbro. The Star Wars [Resistance] Hasbro line has the potential to feel like the first couple of waves of the original vintage Kenner line. From the bright colors to the excellent sculpts, Hasbro has employed their fair share of creativity skills to design a line that SHOULD appeal to collectors of all ages. There is a HEALTHY balance of male, female and trooper characters, and droids and creatures soon will follow. Sadly, I don’t think this line will take off or be successful which I sincerely feel is a shame. I have yet to watch any episodes myself, but I don’t believe the collecting audience Hasbro has for Disney-era Star Wars Entertainment will support this line the way it needs. The show looks good to me, but like so may other longtime Star Wars fans, it’s hard to stay engaged with so much turmoil in the community and hobby. Hopefully, I am wrong about this. Anyway, check out the first wave of figures. Reviews for this line begin in the New Year. Special thanks to friend Russ T. for securing these figures for me so that I can feature them here for you. Found! Star Wars: Resistance Figures Arrive At Walmart! JTA reader and friend, Russ T. headed to Walmart this morning to pick up his TVC Stormtrooper (Mimban) figure. While checking the toy aisle, he came upon a full case of Star Wars: Resistance figures. See you later today, Russ! The official Star Wars YouTube channel released a behind the scenes look for Star Wars Resistance earlier today. In this 3-minute clip you get to meet some of the voice actors, a little is told about each character and you learn more about the general setting. For example, “Team Fireball”, as it is called, has to earn money by racing swoop/speeder bikes. The female character Tam is “tough, no nonsense and kind of has an attitude” according to her voice actress (which sounds like any other female character in movies and shows these days) and main character Kaz is actually bad at spying but has heart (the Star Wars version of Johnny English?). Check it out, the video is full of tiny tidbits and short clips from the upcoming show that will give you a better impression than the short trailer from a while ago. The clip also confirms that the show is made for kids, as one producer says that the show is intended for younger audiences, not for us grown-ups. ← What is Worse: The Fool, or the Fool Who Follows Him? Photo Of Star Wars: Resistance Characters Leaks! 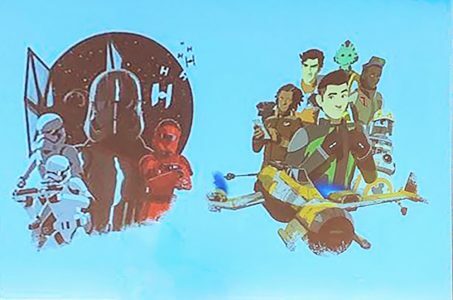 A very blurry and very low quality photo of the Star Wars: Resistance characters has leaked. Actually, the version you can see below has already been enhanced. The photo was shown during a presentation and someone was able to take a picture. Anyway, even though it’s blurry you can still see the cast of the show. It seems Phasma will be the main villain? 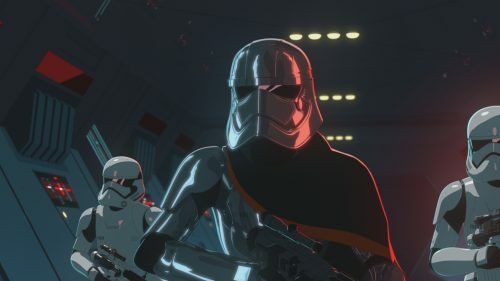 And perhaps the Stormtrooper in all red could be Captain Cardinal from the Phasma novel? What do you think? Leave your thoughts in the comments! New Animated Series "Star Wars: Resistance" Announced! The new animated Star Wars series by Dave Filoni has just been announced. 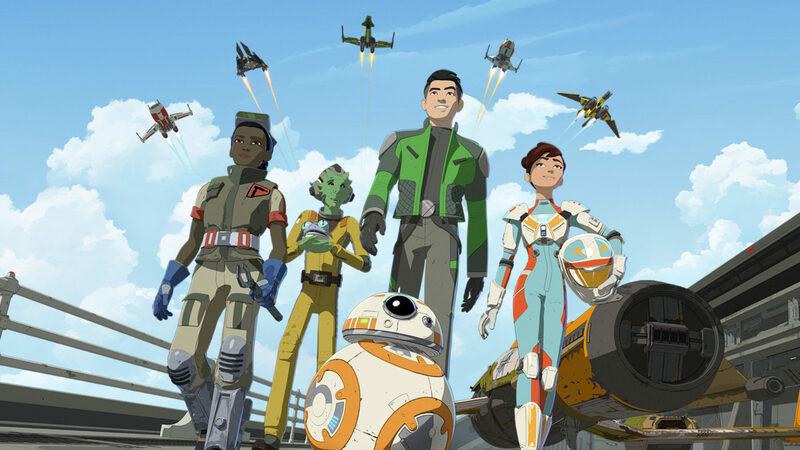 The show will be titled “Star Wars: Resistance”. Click through for more details!